Having exhibited at an every growing number of shows, one thing the paying public like to see are trains moving. As may be seen from the majority of these web pages, my penchant is for shunting layouts whereby the operator is actively engaged with rolling stock. By its nature, shunting is both slow and not continuous. How then to combine the two? A two tier layout is perceived with the lower tier giving continuous running, the upper providing shunting & thereby operator involvement. This assumed of course that once constructed, exhibition invites would present themselves! [ see below]. 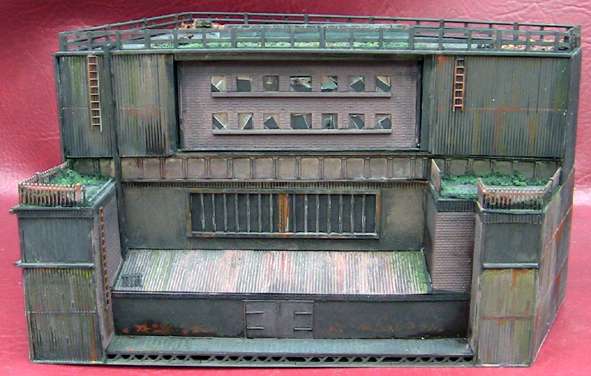 Keeping within the context of "micro", or "field of view", the layout does not exceed 36" x 24". Baseboard & track laying eventually completed June 2012 after about 15 months planning on these pages, using SCARM software, & track tinkering on baseboard ! 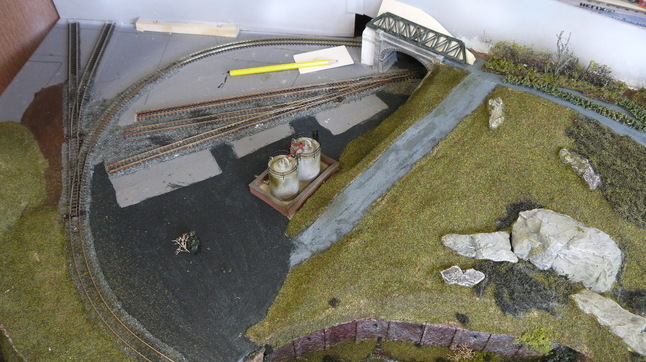 As the layout has progressed, it unintentionally developed into two distinct halves. One woodland, the other, urban dereliction. 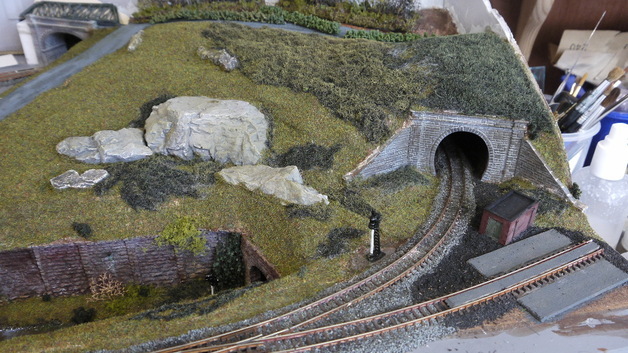 Kidmore Cutting was published in the Journal of the N Gauge Society, 1/13. Trackplan (SCARM) upper level; only one power feed needed. 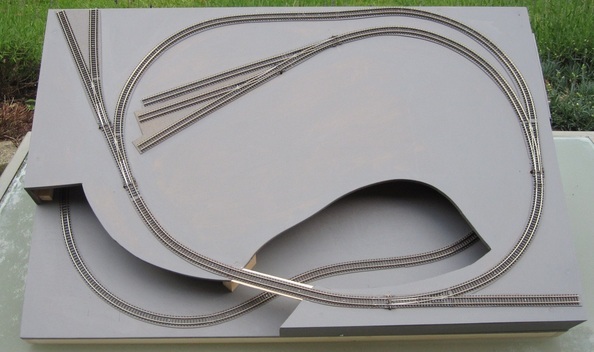 The two sections of the baseboard with track in place. Quite close to the SCARM drawings ! Front RH siding is likely to be repositioned for scenic build reasons. Business side of the top tier. Bottom requires just a track feed, although a shuttle & colour light signals are to be added. 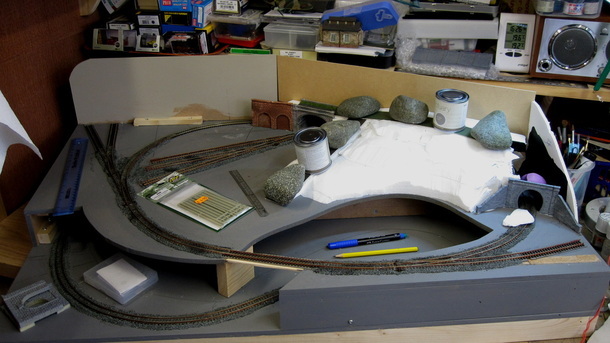 Track now ballasted & weathered. Basic contour work & road (under pebbles!) started on top level. Note RH front siding moved to permit more scenic work. Contour work essentially completed; polystyrene covered with a mix of plaster bandage & polyfiller. Cutting walls installed. Signals installed & wired. Groundwork on the country side progressing well. Industrial side just about marked out. 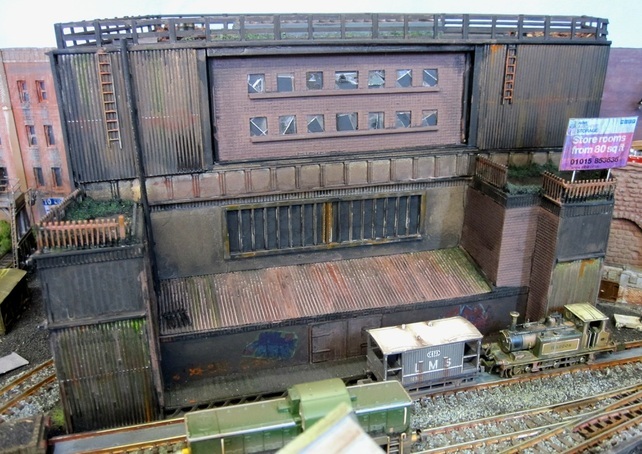 Scratchbuilt derelict foundry through which the track will disappear. Foundry in situ, somewhat dwarfing the Stroudley Terrier. 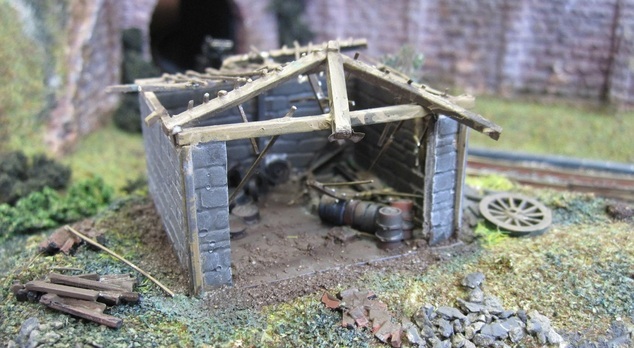 Derelict barn as a corner feature; built off layout.